What questions can you expect to come up each round during a quizbowl tournament? What exactly is “trash”? What’s the difference between the ACF distribution and the NAQT distribution? In this podcast, Ryan, Ben, and Chris discuss the various aspects of the standard quizbowl question distribution. They discuss how to prepare for different parts of the distribution and use the distribution to their advantage in studying and playing quizbowl. In one of the strangest and most intensely fought tournaments in some time, Manheim Township continued their dominant run at the top of the state while hosting their annual spring tournament. This was one of the more interesting days I’ve been at. No one escaped without a loss, and the statistics at the top of the field were very, very close. Plaudits go out coach Missy Doll and Lancaster-Lebanon League commissioner Chris Manning for directing another exemplary run event that got all teams plenty of excellent matches in a timely and efficient way, and the all around great moderating staff Manheim Township provided. The oddest thing about this tournament’s varsity bracket was that almost every single major team was missing critical players, which lead to lots of close bouts and generally depressed scores. Manheim Township itself fielded a team of players who had not already played IS-152, which worked out to be their regular A team, except Nathan Johnson came up from the B squad to replace Jake. They went 8-1, with the loss coming playing as a split squad to cover for a late team. Runners up Lehigh Valley Academy looked stellar, with another dominant Alex Schmidt performance. His 54 powers alone made LVA the tournament’s highest powering team, and with some steady contributing help on bonuses from his teammates Lucas, Ethan, and Nicholas, put up points galore. Still filled with young players and a bit raw, LVA looks like they will be a scary team by the upcoming 2016-17 season. The final between Lehigh Valley Academy (left) and Manheim Township (right) about to start. State College A and Great Valley A tied for third with matching 7-2 records. Great Valley took the head to head matchup, while State College pulled a thrilling last question victory over LVA 290-285 in the most exciting match I personally read. Both teams were down key players (Mahima and Mia for State College; Sam for Great Valley), but still turned in some of their best performances this season. SCHS’s Joey Feffer and GV’s Deakon McCurdy lead their teams well, with 70 and 62 points per game respectively for 2nd and 4th in the tournament. Both squads put in solid attacks with no glaring weaknesses in terms of subject coverage and have firmed up their status as top-5 teams in Pennsylvania and top-100 teams nationally. Great Valley did, however, put up an absurd 35 negs in 9 rounds, which is possibly a Pennsylvania record for negs per game. I’m not sure why this anomalous performance happened but it may have cost them a tournament win. Henderson took 5th. Missing David, Suraj Joshi came up from the B team and proved a stabilizing presence on this otherwise volatile lineup. Henderson played the sharpest they’ve been in a long time, with 28 powers to 16 negs. I was impressed by many of Suraj’s music and philosophy buzzes, and Alex Sankaran added dominating geography knowledge in matches I read. PALCS finished a disappointing 6th, despite having their whole lineup in tow. They suffered a bad break with a wonky buzzer, and lost a close 85 point match to Henderson at the end of the day. With all of the lineup chaos and such, it’s hard to fault PALCS for this finish, and they still got over 330 points per game, and are a group to be reckoned with. Downingtown East celebrates a solid win in the prelim rounds. Lower on in the Varsity brackets, Cedar Crest A landed in 7th with one of their patented balanced attacks. Downingtown East finished a respectable 8th, looking their best in a while. This team doesn’t play on Saturday as much as some of the other teams in this field, so while iffy on some “quizbowl” topics I thought D-East showed lots of real knowledge and good buzzes based on classroom and independent interest material. Jackie Wu’s dominance on literature was a treat to watch. Camp Hill kept on keeping on, taking a lot of losses in such a tough field, but showing good statistics. Many teams also challenged themselves in new ways with this tournament. Lancaster Mennonite‘s Brandon Roe played the event solo, going 2-5. No one in Pennsylvania has as much lock-down knowledge of Religion questions as he does, and it was good to seem him challenge himself and come away with a couple wins. Carver HSES and Huntingdon, two new squads to the PA circuit this season, moved up to try regular difficulty questions for the first time. While both struggled yesterday and will need time to adjust, it’s good to see these teams challenging themselves and continuing to get better while approaching matches with enthusiasm as their programs become more established. Cedar Crest B. From L to R: Tatyana, Erik, and Joe. I didn’t get the chance to see any of these teams in action, so I apologize for the terseness of this wrap-up. Central A, at last marshaling their power players onto one squad, came away with their first tournament win in dominant fashion. They did lose the first game of an advantaged final to Downingtown East B, but behind a double barreled attack from Gabe Gluskin-Braun and Owen Knight (whom finished 1st and 2nd in ppg in the JV bracket) and significant support performances from Ella Comberg and Albert Tanjaya, Central triumphed. I’m glad that this senior-heavy team got to come out with at least one tournament win, and it would be great to see if the get the chance to play anything else. Otherwise the JV provided a nice opportunity for B, C, and D squads from various schools to get in lots of good buzzes and continue to learn. Overall, the growing diversity and size of these fields reflects the hard work and dedication of the many students and coaches (and parents!) who value this game and continue to support it. I can truly see a change for the better not only in kids I’ve had the pleasure to have read for across several years, but also in the opportunities available for all students. Teams await their afternoon seeds after round seven. The first-ever Philadelphia City Quizbowl championships took place on Saturday, March 12th at Friends Select School in Center City and finished with Friends Select School (FSS) A going undefeated to take the championship over FSS B, which finished as the runner-up. Carver HSES A grabbed the third-place trophy (and top public school bragging rights) and Central High School B the fourth-place trophy. The field consisted of 12 teams from five different schools from across Philadelphia. Full stats are available here. FSS B (left) and FSS A (right) just before the final match with their coaches Abbi Smith (standing on the left) and Ian Lockey (sitting, back row at right). FSS A won decisively to clinch the championship. This was a great day for all of the teams and players at the tournament, but with a nearly 400-point average margin of victory FSS A clearly showed that they are the class of the city this year. FSS A’s all-senior team will represent Philadelphia at Harrisburg at the Pennsylvania State Academic Competition in April and will make Philadelphia’s national championship debut at the HSNCT in Dallas in May. Going from having never picked up a buzzer to one of the top teams in the state in less than 6 months is quite an accomplishment and a testament to both FSS A’s raw firepower (check out their power rate!) and quick study ability. FSS B turned in a strong performance to finish as the runner-ups with a short-handed team. Both of FSS B’s “twin towers”–Jake and Richard–are underclassmen and bring history and geography heft as well as unusually strong music knowledge to the table. The key match in the race for 2nd place was FSS B’s extremely close 275-265 win over Carver HSES A in which FSS B’s strong bonus conversion won out. That victory put FSS B in the driver’s seat and an undefeated record until they faced FSS A. Carver HSES A posing with their third-place trophy. Carver HSES A bagged yet another trophy (their 3rd of the year) with a 3rd-place finish. They’re anchored by a triple threat from William, Su, and Dalya who all defend their categories well and play balanced, disciplined quizbowl. Dalya in particular has stepped up and improved throughout the year, and both she and Collins–their seniors–will be missed. Fortunately, Carver has a good supporting cast to build on for next year, especially from their improving B team. (Roughly left-to-right) Central D, Central B, and Central A with their coach, Avi Hockfield, and Central B’s 3rd-place trophy. The four Central HS teams once again turned in strong performances. In what has become a surprising tradition at every tournament so far this year, Central B finished ahead of Central A and in 4th place overall by winning their head-to-head match. Central C and D also had better-than-expected performances and all four teams demonstrated impressive depth for a school that just started playing quizbowl in October. Although we have not seen it yet, it would be quite interesting to see a Central team with its top 4 players–probably some combination of Gabe, Owen, Ella, Wylie, Danny, and Anna– all at once (there’s still time and tournaments if they want to make it happen!). Most of Central’s teams are senior-heavy, so they’ll have a bit of rebuilding to do next year. In the consolation bracket, FSS C ran the table against the opposition to win the bracket (the stats don’t clearly show it, but they were 5-0 in the bracket) over Central C, Carver B, and the teams from Franklin Towne Charter and Science Leadership Academy (SLA). Franklin Towne and SLA are both very young teams of almost entirely freshmen and sophomores who are just starting out with both quizbowl and high school as well. This should be a great learning experience for them and I was pleased to see that every team left with a win. 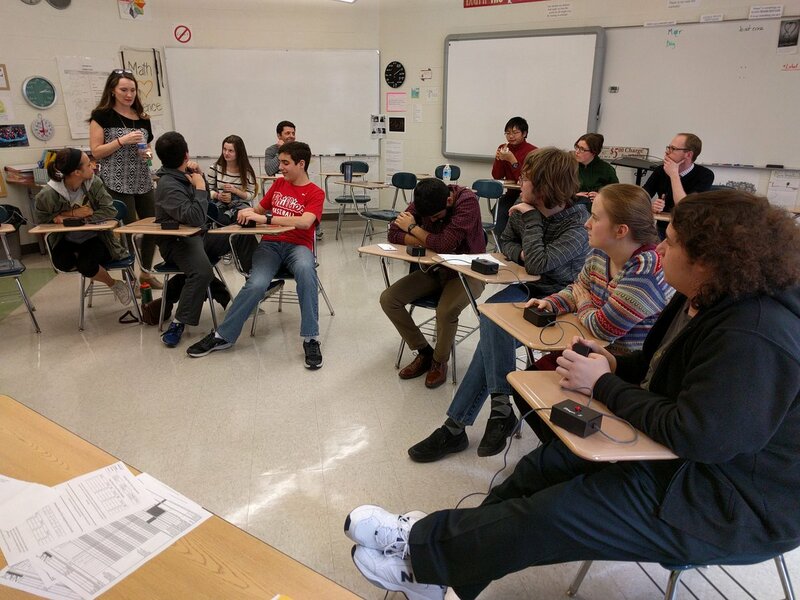 A number of new players in the Consolation bracket made some impressive quizbowl debuts as well. FSS C’s Jasper was originally going to scorekeep, but decided to play instead at the last minute and put up an excellent 63 PPG. Central C’s Anna also did well with 6 powers and 28.75 ppg despite a strong shadow effect from Owen; SLA lost their lead-scorer from QFO but added the 21 PPG of Jack; and Christian from Franklin Towne A averaged over 20 PPG in his quizbowl debut. One of the most impressive things that I saw yesterday is just how much teams and players have improved from even a few months ago. Carver A for instance went from 11.3 Points-Per-Bonus in December to 15.3 yesterday and Friends Select A’s PPB similarly increased from 21.48 to 24.15. Those increases came in just 3 months of studying! Any team can get good at this game and it’s great to see that teams have been taking advantage of quizbowl’s copious free study resources to improve so quickly. As an added bonus, an ABC 6 TV camera crew stop by for what turned out to be the de-facto 3rd place match between Carver A and Central B. Check out some fuzzy videographic evidence here. All in all, this tournament marked a huge step forward for quizbowl–and intellectual curiosity and friendly academic competition in general–in Philadelphia. The coaches are awesome for taking time out of their extremely busy lives to come and support their teams along with a good number of proud parents. Major thanks to the superb moderator group that we had: Bill Tressler, Bern McCauley, Ben Herman, Eric Mukherjee, and Ian Lockey plus several guest-mods from FSS. And a particularly huge thanks to Abbi Smith at Friends Select who poured tons of time and effort into helping to organize this event. I am very, very excited about the direction of quizbowl in Philadelphia. I look forward to seeing all these players next year at both high school and college tournaments along with a whole new crop of players, teams, and schools from every neighborhood in Philly!